Heat oil in a cooker,fry the cut potatoes(cut into big) to light brown in colour along with beans.take them out and leave aside. In the same oil add the sliced onions along with green chilles. When the onions turn golden brown in colour add the ginger-garlic paste and fry for 2-3 minutes. Add the tomatoes along with red chilli powder,turmeric powder,salt and garam masala powder and fry till the tomatoes are well mashed up. Add the curd,gosht ,coriander leaves and mint leaves. Do not add any water.Pressure cook for 10minutes.Transfer this to a wide big vessel.Add the fried potaoes and beans. Add 7cups of water and salt to taste(add about 8-9tspns of salt). Also add whole garam masala Loung,patta,elaichi and shazeera. Bring the water to boil and add the soaked rice. Cook uncovered till almost all the water vanishes,keep stirring every 5-10mins. Now cover the lid and cook till the rice gets cooked. 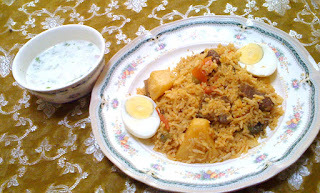 Serve with boiled eggs,raita and bagare baigan or mirchion ka salan. Thanks for the true/original recepie. Everywhere on the net i see ppl having there own versions of Tahari, but this one rocks. Mouthwatering! I want to try! Anjum, Aloo Gosht ki Tahari is one of my favorite one dish meals. I will definitely try your version. Also the click is delicious. salam...I know this is a very old post and I m not sure if you would still be responsible to it.. I've tried a few recipes of yours before and I keep coming for more..
just this time I had a doubt..
how much is 6 cups of rice? could I get the measurement in kgs please? thanks..n I hope you keep updating your blog more frequently..I crave for authentic hydi dishes! Salaam, when I say 6 cups it's about 1 kg approximately. Yea, I need to spare sometime from kids and update te blog. 1- Marinate the mutton with masalas, salt, red chilli powder, turmeric powder and ginger garlic paste for half an four. 2- Add sliced tomatoes (strictly red & desi) and yoghurt after frying the mutton, it makes the mutton more tasty after cooking. 3- Add a cup of fresh methi leaves. 4- Prefer sem phalli over beans. Sister, I found your recipes very much similar to my ammi's recipes. Can you mention approximate quantity of salt in future posts? Since, quantity of salt affects a lot on taste, it will help a lot for freshers like me. Are you still active in this blog? Have some doubt and questions on quantity and timing for cooking.